Devington Park Editorial - an expression of the devingtonpark.com view of events. Devingtonpark.com gives it's views on events happening on the Park and the management thereof. Please read through our editorials. If you wish to contact us please use the Contact us page. You may also use the Contact us page if you have a suggestion for a new Devington Park Editorial. A few comments relating to our recent AGM of 13th. June - just to remind the Board that some people do have a view. What a shame the AGM minutes can’t even get the names of the Directors right! Outside of the gushing praise for the managing agents - just amazing that the previous minutes were nodded through without any comment. We had to chuckle at the comment made by a Leaseholder regarding “that the grass cutting lawn mower is garbage”. Well just have a look at our 6th. April 2015 editorial entitled “One man went to mow”! The same editorial went on to rue the Board’s “wonderful decision” to get rid of the fantastic gardeners we had at the time. We told you so at the time. And they call it management! A comment was made that there remained only a very small and inadequate sinking fund for any emergencies which may occur in the future and that “It was noted that the Sinking fund is sinking; this is because 2-3 years ago work was addressed and funds used for that purpose. Prioritisation and assessment is made by Crown”. Yet the chairman of the meeting commented that “if the Sinking Fund has gone then we will work on replacing it; she will consider increasing the Service Charge if necessary”. Well - What other plan is there to increase the sinking fund without increasing the service charge, or is there “a cunning plan”? It was clear that residents acknowledge that the Caretaker does not have adequate resources to carry out cleaning tasks. If this is true then it merely indicates that an inadequate amount of funds is being made available for such expenditure. But, hey it’s dead cheap ain’t it? The comment regarding 10 Mansion House being advertised on Air B&B. What a weak reply given by the Board! What the hell is the Board doing about it? Where is the follow up? At the same time, what on earth is the Board doing about the breach of other covenants, specifically parking and the display of washing. Or is the last item not really important to the Board as one of their members is one of the culprits! The proposal to provide car charging electric points on the site has some merit (if for example when a large proportion of Leaseholders own electric cars), however in reality, at this stage, it is pie in the sky. This is because nobody here has an electric car and nobody will want to pay for the capital cost of installing such expensive charging points. Considering our “sunken fund’, where on earth would the money come from? The cost of any installation of this type of charger should be made exclusively by the owners of electric cars, should they require it. Additionally, surely this type of installation is completely outside the remit of the Devington Park Lease? We would appreciate you comments on this. What do other Leaseholders think? Since the tragedy of Grenfell, is it not time for the existing “Stay put” advice given to residents previously by the Managing Agent, to be reviewed, together with the reasoning behind such advice? Finally - What an outrageous cheek! - Using the auspices of the minutes of our AGM to advertise the Managing Agents wares. Communication updates - we don’t consider it unreasonable to expect monthly updates from our Management Board to leaseholders and residents. This was previously promised, and did not materialise. Bi-annual Newsletters is not sufficient. Our current understanding is that there is only three members on the Board. Surely there should be a greater number than this? The Christmas letter from the Board hinted at a strategic plan, “available on request.” Well, we are requesting it for all the leaseholders and tenants. Please publish now. Why should leaseholders need to “request” the details. We need to know what is planned, including a time schedule for the work. We are surprised to observe that the lobby of The Mansion House has become unavailable to the Leaseholders and residents of Devington Park. It is clear that access is only available via a keypad access code. May we remind the Board that the ground floor of the Mansion House is a communal area for all residents. Creating a keypad barrier denies this right. There has been no notification whatsoever to residents that the front door to the Mansion House is now locked. We see no justification for this action and require means of access to this communal area to be published to residents throughout Devington Park. We recall talk of a defibrillator being supplied to Devington Park. Will the Board clarify whether this is to be supplied? We assume that this would be installed in the Mansion House communal area. It was recently put to us that the practice of the discharging of waste water from the cleaning of our waste bins into the road drains may be illegal. Is the Board aware of this, and is the Board happy that they are working within the constraints of the law? We do not want to end up with a big fine if things are not correct. A belated Happy New Year to all our readers, and Happy Valentines Day tomorrow. Just like Slade’s perennial ear wrenching Christmas song ‘Merry Christmas Everybody’, we’re back again with our Christmas message to all our readers. We must congratulate George for his sterling work in getting our Christmas Tree up and running in good time for the festive season. This will be really appreciated at our carol singing and local choir gathering (and if you expect that to happen, then you must also believe in Santa Claus). Surely the scaffolding around the Mansion House (hardly used for around two months) could have been removed prior to the Christmas tree introduction. It’s now nicely lit up by our lights - merry Christmas to the scaffolders! Are we to believe that we are actually paying for this unused scaffolding? Pedestrian visitors to our Park cannot help but be aware of the very poor condition of the flower beds to the left and right of the main entrance gates. We know that gardens generally don’t look their best at this time of year but surely, the beds could be weeded, and the mountains of leaves removed. The condition of the gardens continues to deteriorate. Unfortunately, as we predicted, with the manpower available, what can you expect? Actually, we do expect better for our service charge. Like it or not, all the entrance doors are being repainted. But why is it taking so long? Is it not the responsibility of the Board to inform the members of the Company when there are changes in the number and identity of Directors? The Devington Park grapevine hints that there have been several changes recently. If this is true, why have we not been officially notified? Surely, there has to be a legal requirement for changes of Directors to be notified to company members? Or can’t the Company Secretary be bothered? Anyway we wish them all a Happy Christmas, whoever they are. Finally we would also like to wish all our readers a very Happy Christmas, and a healthy and prosperous New Year. Devington Park is a wonderful place in which to live, and long may it continue. Autumn is around the corner once again and as we say farewell to summer we will be checking and firing up our central heating in preparation for the cold nights ahead. This perhaps is a good time to comment on the recent ‘helpful’ advice from Crown regarding fire safety. Is Crown really suggesting that we rush out and instal fire alarms in our properties? Our understanding of fire alarms is a box on a wall which we break the glass to set off a fire alarm bell? What is wrong with the smoke detectors we all have installed in our properties? Could Crown be more specific and explain what they really mean by their ‘advice'. Pat testing? isn’t this something required for safety in factories, offices and industrial premises? Is this really appropriate for domestic dwellings? We really require more appropriate advice, indeed if we need it at all? Do Crown really think we are all stupid? Or is this ‘backside’ covering? As you will have probably noticed, one of our continued grouses has been the gardens. It is quite clear that we see them through completely different eyes than the park management and directors. Why can’t they see the large numbers of weeds that we can? Or do they not realise what weeds look like! Some of them are getting to the point of being dangerous as they are covering paths and steps on the Park. For example the bottom of the steps leading down to the Gym is covered in weed growth. What will it take for this area to be cleared? Someone could have a very nasty accident through this neglect. A walk around the Park will reveal numerous examples of weed growth which is just not being addressed. We are confused as to who is responsible for overseeing the gardens. Please, please can we have a suitable team of gardeners who are capable of differentiating between a flower and a weed, and keep the site weed free, as did out previous gardening company who were dismissed out of hand. Spring has sprung at Devington Park, but it doesn’t look good! The gardens around the Park, particularly those outside resident's front doors, quite frankly are a disgraceful mess, and look very untidy and weed ridden. The pond is horribly overgrown to the extent that the duck house can barely be seen. Even the ducks don’t want to stay there! This is just not good enough - but what can you expect when the professional gardeners were sacked (refer to our editorial of April 2015), and replaced by two people doing their best. Are we surprised at this? Two years ago we said that this would happen, and regret to say that we were horribly right. Does the Board and Management ever walk around and really look at the Park? Presumably not. If they did, we wouldn’t need to be making these comments. Please will the Board address this situation before it gets beyond redemption. Remember Johnny “Two Jags” Prescott? Well, we are reliably informed that we have our own Johnny “Two Jags” taking up two Official Visitors spaces, in addition to their own space. This is very selfish, and against the terms of their Lease. Having said this, "Johnny" is not the only resident permanently parking in Official Visitors spaces. Whilst on the subject of the terms of the Lease, we also note that, near to Johnny “Two Jags” is Mrs “Wishy Washy - Chinese Laundry”, who likes to leave her washing to dry outside for all to see. This is highly contagious as it now extends to their neighbours. These are not the only offenders, and it is worse at the weekends. Considering that the Managing Agents recently sent a directive informing residents of their commitments regarding this issue, it is quite appalling to see that people, who should know better, completely ignoring this. Please would the Board and Managing Agents get their act together? We were so pleased, and did appreciate the recent newsletter from the management committee. It answered pretty much all our queries, and it was gratifying to receive it so quickly, following our last editorial. We consider that one of the most important tasks during 2017 is the painting of our properties. Why wait until after Easter? It should be started prior to this! Will the painting be continued by Tom? Is this schedule attainable with only one painter? We read that a comprehensive gardening schedule has been written. We would be grateful if this could be published so that all the residents can see what can be expected of the gardening this year. We note that, even at present, the grass requires cutting! In response to the plea for new board members. Do we really need more committee members?However, if leaseholders do wish to apply, could we suggest that it be a requirement that new board members actually reside on the Park? We hope that our dialogue may continue for the benefit of all the Park residents. Since the Residents Association died and went away, we are wondering whether we still have a management board. Well we never hear from them, and wonder whether they are hibernating over the winter period. The same could be said for the managing agents, however we’re pleased to see that George is around, and seems to be “the managing director” in the absence of seeing anyone else! Does Sam still visit on a monthly basis? If so, why don’t we receive any reports? Our previous editorial pointed out that Ricky has gone, Glyn was removed some time ago, and now, we believe that Tom the painter has gone. We wonder what the reasons are for this? So who is left to maintain the Park except for George who, with the best will in the world, can’t do everything. Why can’t the Park management keep employees? Could we ask the management board to advise the Residents on the Park of the changes in the employees, and why we have lost so many over a fairly short period? George does a tremendous job, is a very nice guy and really tries his best for the Park - but he can’t do it all. He is not a gardener, a joiner, electrician or painter. He is a janitor/caretaker. Devington Park needs professional workers to care for it. PLEASE, PLEASE, PLEASE - more information is required for the Residents, especially in the absence of a residents committee. We are sure that the board reads our comments - but if they don’t - they jolly well ought to and, by not doing they are missing out on vital feed back. Call it Déjà vu if you like - the effect is the same. Once again we get a hard working guy helping to keep Devington Park looking reasonable, only to find, he’s been told “your services are no longer required”. What the hell is really going on here? Why was he dismissed? Was he seducing the old dears on the site in his lunch break? Or was he selling off the roofing lead? Of course not! He was a good guy doing as good a job as one man could possibly do on a site of this size, only to be presented with his early Christmas present from “The Board”. Wouldn’t it be nice if we could be informed before the event rather that have to find this sort of thing out by rumour? Just what is the real reason for our man to be given his marching orders? We insist on being told very quickly, or is this just another example of “the mushroom effect”. We note that many of the doors have been repainted the new colour. Notwithstanding the excuses given for the colour change, we would accept that there may be an argument for a reduction of maintenance, but we have to say that many people are commenting that “it looks just like undercoat”. It certainly does not look in keeping with our historic buildings. Just our opinion! What do others think? We were pleased to see that a recent circular from the managing agent, contained very clear reminders of the lease requirements to which we all agreed to abide by, when we purchased our leases. It is a pity that some residents still do not abide by them, particularly those who really should know better. Crown’s monthly visit has been going on for a little while now. Has this proven to be useful? Any comments would be welcomed. P.S Anyone seen a cherry picker around the Park? If not - how are loose roof tiles being replaced? Just a quick comment this month. Following on from our last editorial, when we made a remark regarding the proposed car park down the road from Devington Park, we suggested that it really had nothing to do with Devington Park. In spite of this, we note that the subject is part of the AGM meeting during this month (15th. June). On the same basis we wonder whether the Referendum will also be discussed. If so, we suggest that Devington Park votes - Leave!!! We look forward to the AGM!!!!! Nice to see that the longer days are with us giving us the opportunity to stroll around our park during these warmer evenings, and to sit by our pond, and look at the ducks. 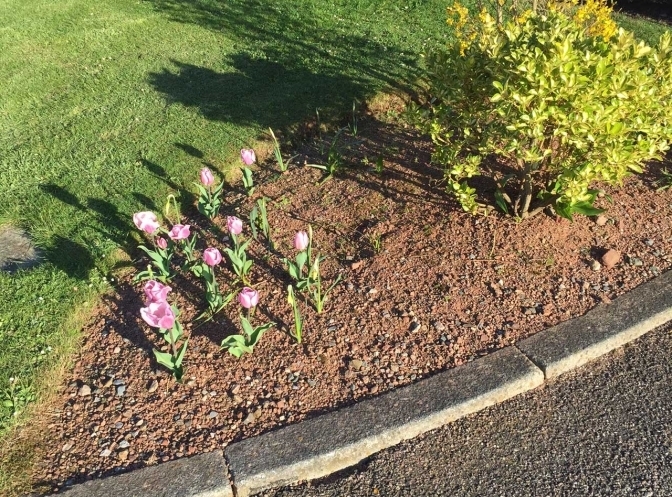 We have recently wondered whether the daffodils mentioned in our last editorial, have changed into tulips, as there are more tulips to be seen than daffodils. - In praise of George! Our lone caretaker is doing a splendid job in keeping the park very tidy and clean. Many thanks from us all. You are doing a good job for us. What a shame that we can’t say the same for the site painting which is still at a standstill. We did mention this in our last editorial, and we think that our park management should feel utterly ashamed of themselves for neglecting this very important aspect. What more can we say? The problem will soon become too great to be dealt with! Several people have complained that they have received unsolicited literature, from an unknown source, relating to the proposed car park near to Devington Park. Why we are receiving this is questionable, and we consider that the issue is nothing to do with Devington Park. Well - Spring has sprung and we've been out trying to find all the new daffodils mentioned in the board’s news letter of December 2015. 1000 extra daffodil bulbs; hardly one to be seen though. Did they get planted? Were they planted the right way up? Clearly they are well hidden! Of far more importance - PAINTING! Will someone please, please, please tell us what the painting schedule is going to be for this year, or is this too much for our Agent to work out? This is now a really serious matter as so many properties have badly peeling paint! How can we be told in the Board’s last news letter (December 2015) that “ ……… having caught up with the painting that had fallen behind last year”, since nobody has ever seen a schedule of painting. We think that this is disgraceful and we urge all leaseholders to press the Board for information and painting action. A walk around the site, especially in the evenings and weekends, will show that parking has reduced to the level of trade vehicles being parked illegally, motorbikes parked on pavements, and residents vehicles parked in visitor spaces. There is nobody here to take an interest in illegal parking any more. However, would we really expect directors who don’t live on site to be that bothered? Finally, as we alluded to in our last editorial, the Residents Association is now non-existent or, as the board describe, “moribund”. What has the Board done to cause this - and what are their plans to resurrect it? Well - end of January already! Doesn’t time fly? It is apparent, as we suspected in our last comment, that one of our two caretakers has gone, and is not coming back. This is a real shame, as he was a good and hard working man. As we have not been made aware by the management committee that he has gone, despite our request for information, we can only suspect that he did not go of his own accord. Did he fall or was he pushed? In any event we miss him, and would like the courtesy of being made aware of his departure by our board, since we pay the bills here. Is this another case of déjà vu? No doubt the above comment will be read by the management of our Park - our other readers would surely appreciate an explanation? We do not receive any news from our Board of Directors, in spite of the promise of monthly news letters. For example, rumour has it that the Director total is now down to three - none of whom are resident on site. Companies House tell us that the last Directors resigned during October and November 2015. Why was this information not forthcoming from the board? The Residents committee, as we discussed in our last comment, appears to be a dead duck. This is a terrible shame! Could this be officially confirmed? It is noted that a couple of hundred quid has been knocked off the service charge for 2016. The reduced charge partially reflects the reduced service! This is an open letter to the Devington Park management committee. First of all we wish you a Merry Christmas and thank you for organising the very nice Christmas tree currently gracing the park entrance. We look forward to the carol singing and mulled wine to follow. We do have a few concerns though. We recall that, at the AGM earlier this year, you promised monthly updates regarding the Park. However, since the publication of the AGM minutes, nothing has been received by way of news letter, or report. We also recall that we were to receive a summary of the minutes of board meetings, which have never materialised. In the absence of these reports we continue to feel in the dark as to what is happening on the Park - rumour has it that "one of our caretakers is missing". Please may we be enlightened on this, and any other information we should know about. After all, it is our money paying for all this! Whilst on the subject of money. Don’t you think that we should have been informed by now, of the service charge for next year? This, surely ought to be considerably less than this year, due to the reduction of services. We understand that the only director who lived on site has now left and, to our knowledge and concern, leaves a situation where there are no resident directors living on the Park. Furthermore we understand that the Residents Association has disbanded, as no minutes have been received for some months. Surely the Park members, who pay the service charge, need to be made aware of these situations. We suggest that we are not getting very good value for money here. Finally, we would like to thank our site staff who have struggled to manage an impossible task over this year. It is usual for Devington Park to have a nice, large Christmas Tree, beautifully decorated by the site staff, in a prominent position outside the Mansion House throughout the festive season. Our understanding is that, traditionally, it was supplied by our (then) gardening contractor, County Grounds Maintenance. However, as they were dismissed earlier this year, we wonder where the tree is coming from, or indeed, if it is coming at all. On a specified date nearer to Christmas, the local school provided a choir to lead carol singing around the tree, the Parents Association kindly providing a hot drink service, and an invitation to local villagers to join in was very popular. As the school obviously required some notice, we are concerned that this may be overlooked. We hope our concerns are unfounded, and that this has the support of other residents. It is now nearing the end of October - how time flies! We note that since June, we have not heard anything from our management board, despite their promise earlier in the year that they would publish a monthly report. So why do we bother with all this? Why don't we just stick our heads in the sand and let the hedges grow, the parking go to pot, visitor spaces used by residents in the evenings, the paint continuing to peel off the windows, the washing blowing outside in the wind, the bins to smell bad, and the gardens to grow wild? Because we care about Devington Park, thats why! Because we can’t stand by and see it go downhill just in order to save a few bob on the service charge. We wish that more people would contribute to the web site. We are not unfairly critical of anyone, either on the staff or management - all we wish is that the Park is kept to the high standard it was hitherto. We have a management board all except two of whom do not live on site. We think that this is very wrong, and that all directors must live on the Park. Ad-hoc visits just do not cut the mustard! The one man gardening force really is just not enough. This site is far too large. We note that grass cutting is almost full time and is completely out of proportion to the time being spent on ‘proper’ gardening. Top deck bus passengers en-route past the Park must think that the Park looks lovely at the front, and we are well aware that a disproportionate amount of time is being spent on the front of house to the detriment of the rear. We believe that more money needs to be spent in hiring professional gardeners. We believe that the site caretakers should be given instructions to report lease violations and parking abuse to the site management, for them to take further action. If this complies with your views please give us your feedback to the website. P.S What has happened to the Residents Association? Is there still one? 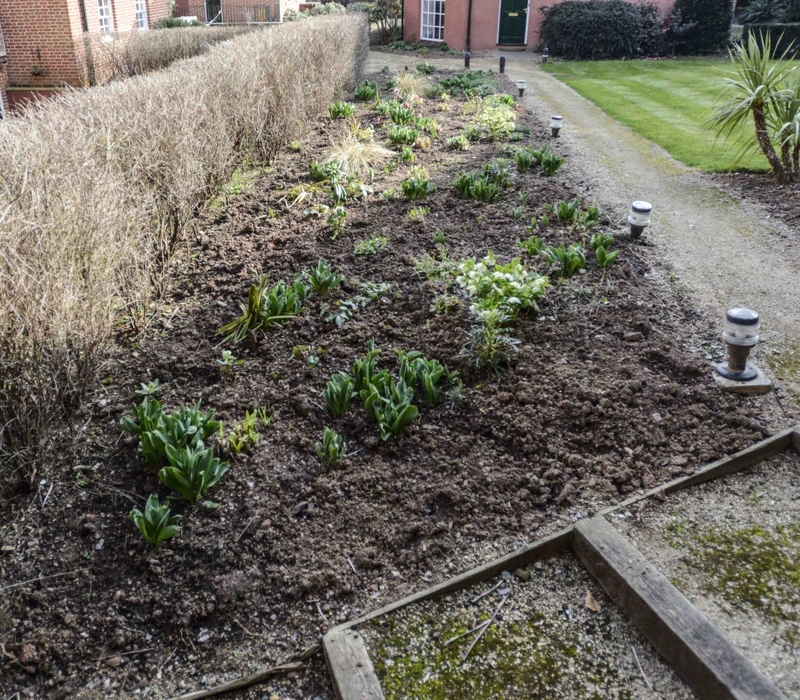 At the recent AGM we heard leaseholders comments, and the board acknowledging that the majority of those present were unhappy with the activities of the board, with particular respect to gardening and painting. Our small band of workmen has been increased, so hopefully we might soon see improvements in both directions. This is encouraging. We question the “invitation” to have an estate agent (non-leaseholder) present at the meeting, when even resident tenants are not permitted to attend. We disagreed (as you would expect) with his comments about our website. However we do tell the truth, and have as much right as anyone else to our opinions. Compared to the ‘“official” website, the “alternative” website gets to the point and invites comment and feedback, and it is up and running, unlike the “official” site. Will the board advise leaseholders as to how many of the parks properties are in “absent landlords” hands i.e rental. Opinion appears to fluctuate between 60% and 80%. Could we have an accurate figure for transparency? We question the relationship between “Buy to Let” property and the effect on residual property values. The important thing here is that the majority of leaseholders owning property at Devington Park do not, and have never lived here. This surely must have a detrimental effect on how people think of Devington Park, it’s upkeep and importantly, it’s service charge (as referred to by “the estate agent”). Turning to the Chairman’s report. “Accessible and transparent”? How can this be? We are not consulted or even informed in advance about issues pertaining to the Park, so how can this considered to be “transparent”? We would like to be informed as to the “many informed and helpful suggestions” given to the board from the RA? This is not borne out by the RA minutes! The board say that they have had many contacts from leaseholders - but what contacts? Here’s a suggestion - when is the board going to stop the practice of hanging washing out! We want Devington Park to be the same high standards as hitherto. If we work together, this can be achieved for the benefit of all leaseholders and residents. After! 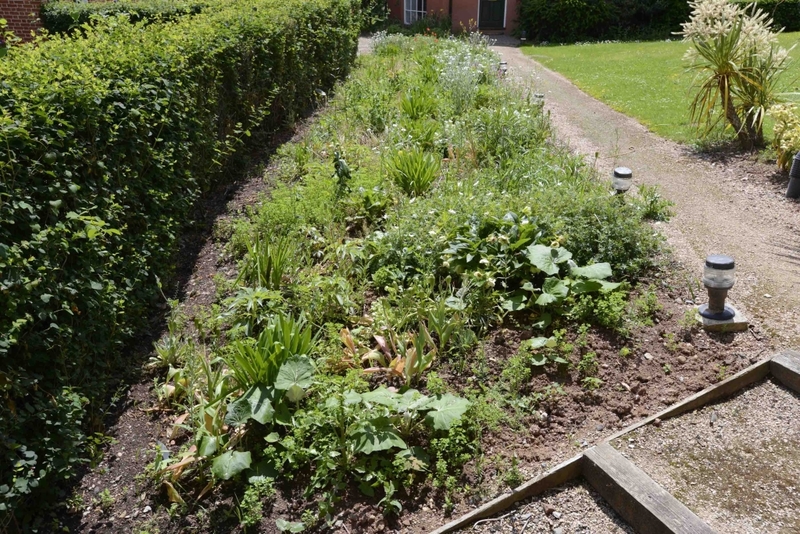 - same view of Cloisters garden in June 2015 - unkempt, uncultivated and weed ridden! A picture is worth a thousand words, so they say. The above image taken earlier this month is symptomatic of the decline in gardening expertise since our gardeners were dismissed last April. Please walk around our site and make up your own minds. Should you agree with our assessment please make your views known - loudly. Hopefully our professional gardeners may be reinstated. P.S Looking forward to the AGM and wondering as to just what we about to hear! For example - the washing hanging out and the commercial vehicles parked on site. We see that the AGM is scheduled to take place on 15th. June. We noticed that following the official business there is to be discussions relating to ‘The Alternative Website’. We appreciate the publicity given by the notice but we really do think that there are far more pressing subjects to discuss, which were not even mentioned in the notice. - The deterioration of the gardens since the dismissal of our professional gardeners several weeks ago. - The total lack of painting to our properties since late last year. - The dismissal of our pest control officer without, to our knowledge, alternative measures to stop additional ‘’unwelcome little furry residents” moving in. None of the above items have been officially communicated to the Leaseholders. Not wishing to sound contentious, but considering that 75% of the Board do not live on site, is it not surprising that the above items were not noticed or included by the Board in Any Other Business? We know that the Board reads our editorials so may we respectfully request that the above items are added to the AGM meeting “Any Other Business”. Having read the Board’s previous comments to the leaseholders regarding this website, we would say it is not, and never has been our intention to be negative in regard to the running of our beautiful Park. We are here to act as a pressure group in order for leaseholders to express their views, one way or another, with regards to the running of the Park. We do not see any valid reason why our anonymity should make any difference to the goals of our group, and our lack of anonymity would not serve any useful purpose. We have now seen the April “newsletter” from the board. We look forward to the AGM. We do question the closeness of the board’s work with the Residents Association - this was not borne out by the last RA minutes. We wonder at the statement regarding ‘vast majority’ as we have been unaware that leaseholders have been officially requested as to their views on the changes at Devington Park. May we suggest that surveys are made of the DP leaseholders, requesting their views as to the running of the Park? The majority of people who live on the park are tenants and we suggest that their views should be included? Surely, this could easily be carried out? Nice to see that some essential repairs are completed. Could the unsightly scar left by the burned- out car, unresolved since last mid December, be addressed please? Why were the residents not consulted as to the gate closure time? The bins are not run more efficiently! The ‘fly-tipping’ problems with the bins are not resolved or supervised, as previous. The remaining “newsletter” items mentioned are general, and the very least we would expect for our service charge. Parking - Is slowly reverting, to as it was previously, with commercial vehicles parked overnight, and visitors spaces are being abused. Our deepest concerns still remain - gardens, painting and vermin control. The excellent contractors who were responsible for these items have all been dispensed with in one shape or another, some weeks/months ago. Why have we still not been made aware that our gardening contractor was dismissed? The DP gardens will, in a few weeks time, start to explode with growth. As far as we are aware there are no plans to control and properly tend our beautiful gardens. We ask that, whatever the plans, they are carried out by professional gardeners and not compromised in the hope that we can save money. Is the ‘Residents Association’s gardening liaison person’ happy with the current arrangements? To a far greater extent the painting of the windows, doors and other woodwork on our residences is paramount. We are well behind and have lost the whole of April, when this type of painting could have been commenced. We await schedules, as provided in the past, as a matter of urgency, together with a plan as to how the work will be carried out now that we do not have a professional painter and decorator on site. Why was the vermin control contract terminated? Why were we not informed? Do not believe that ‘out of site is out of mind’. These little critters will soon make themselves known, if history has anything to do with it! All vermin control professionals will tell you that there is a much higher risk of problems with infestation this year, due to the recent mild winter. We agree that Rome wasn’t built in a day however, we were of the impression that Rome had already been built - our concern is for it’s proper maintenance! "One Man Went To Mow?" One month ago - we had a professional team of gardeners comprising two RHS qualified lady gardeners and in the region of seven assistants, led by a well respected manager. They carried out the grounds maintenance on our eleven acre Park with the help of their equipment including grass mowers, cutters, strimmers, hand mowers, special bank grass cutters, waste removal vehicles, commercial vacuum equipment etc etc. This resulted in grass cutting and waste removal of parkland and gardens, hedge cutting and trimming, flower bed maintenance, Avenue leaf clearing, planting and pruning, weed control and all the many activities resulting in the beautiful grounds known as Devington Park. Today - (as we have not been informed officially) we believe that we now have ………. Is this really what we pay our service charge for? It has come to our notice that the board has communicated a few of the recent events at Devington Park. Many residents were not aware of the existence of the two caretakers. It is a shame that we could not have been properly informed weeks ago on or before they started! We understand that the fire hazards are being addressed. We really do feel in the dark on this matter. Surely it would be a good thing if the residents could be fully informed as to what really is the problem with the roof voids. Painting - here we are, almost three months through the year and we still have not completed the 2014 painting! No wonder so much of the paintwork is peeling off! Are we employing professional painters or amateurs? What do they mean - “budget … permitting”. What are the leaseholders paying for here? Is there not a budget already allocated for painting? We agree wholeheartedly with the sentiment of the board’s concern regarding the residents responsibility to comply with the lease but wonder if, without a Park Manager to observe non-compliance, will this really happen? We are disappointed that the board consider that the ‘Alternative’ Devington Park website to be “malicious”. This is not the intention of the site. Our intention is to promote opinion and to act as a forum for the leaseholders and residents of Devington Park to express their views. We are surprised that the board do not recognise it as a legitimate way of receiving feed back. We will publish any comments from contributors provided that they do not not include derogatory comments about other people. Incidentally we note that the board have not so far informed the people living in Devington Park, that they have dismissed our Gardeners, and also our Pest control contractors! Both our maintenance staff left (or are leaving) the Park within one month of each other. One was made redundant and the other, so concerned about his future employment, that he resigned. Adding insult to injury was the extremely defensive letter sent by the Park Directors blaming the issue on previous board members, as if they had no option. They seem to think that people on the Park believe that The Park Manager and his assistant got the sack and so they are now making sure that we are all made aware that this was not the case because they made the Park Manager redundant, and his assistant found a better job elsewhere. Do you know anyone who thought that the manager and his assistant got the sack? We don’t and what’s more we believe that hardly any one else does either. The rumour mill seemed to have it pretty well correct.The fact remains that, on their own admission the board started the rout with the redundancy of one employee and appear unable to understand that the employee left behind was so scared of being next, that he jumped ship at the earliest opportunity in order to protect himself. Funny how some employers just can’t understand the theory! Enough of the Board’s excuses, the end result is the same - Devington Park is the loser and has effectively been well and truly stuffed! Was it not beyond the wit of the Board to imagine the consequences of their actions? Did they not have the forethought to arrange alternative maintenance solutions before getting rid of our Park Manager? Did it not occur to them that The Park Manager’s Assistant may not have wanted to carry on with that in the background - and what on earth was that alternative job all about? Was this a majority decision? They said that “Devington Park can’t afford The Park Manager”. Well, did they ask you if you could afford him? They certainly didn’t ask any other leaseholders. Comments being made to devingtonpark.com say the same thing too! The duties of the Park Manager and his assistant are essential to the smooth running of Devington Park as indicated by the responses received from the leaseholders and residents. The paragraph near the end of the letter is just so embarrassing! It shows that the board is so well planned that they find the need to ask the residents and/or tenants whether they would be interested in “fulfilling some or part of the caretaking and/or painting and decorating or applying for the job”. This really takes the biscuit and shows that the board think of these roles as those easily fulfilled by amateurs!